See if you?re eligible in less than 10 seconds. To apply click here? 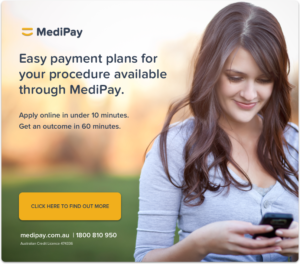 or call MediPay?customer care team on 1800 810 950. There are a range of payment plans and funding options available that you may be able to source yourself. Finder.com.au?is one source where a range of credit options are available. Please consult your financial services advisor for more options and ensure that your have the right payment plan that suits your circumstances.